A lot of us underestimate just how important a good night’s sleep is. Without the seven to eight hours of nightly shuteye that experts recommend, our cognitive function decreases rapidly. What’s more, sleep deprivation has even been linked to type 2 diabetes and coronary artery calcification. These are pretty major consequences for skipping sleep, something that most people see as harmless. 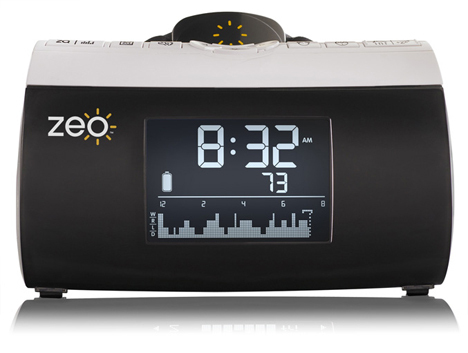 The Zeo alarm clock aims to keep people healthy by giving a daily report on how well the user sleeps. The main premise of the clock is that it tracks how much time is spent in each stage of sleep. The user wears a thin headband all night which conveys information about their sleep cycles to the clock. In the morning, the data is displayed on the clock unit, including a unique “sleep score.” The clock even has an option that will analyze the user’s optimum waking point, waking them up just when they will be the least groggy. What’s even cooler about the Zeo is that you can upload the data from the clock unit to the company’s “sleep coaching” website. If you pay for personal sleep coaching, you’ll receive personalized information on how your activities, diet and sleep environment are affecting your nightly Zs. While it won’t help you fall asleep or stay asleep, using the Zeo may just help you identify your particular sleep problems. But at $249 for the clock alone and $349 for the clock with sleep coaching, it’s a whole lot more expensive than just taking a couple of over-the-counter sleep aids.